SPIDER-MAN: SPIDER-CYCLE CHASE - Lego Super Heroes Set 76004 Review + Super Hero Mash'Ems! VenomTM has taken control of Nick Fury's S.H.I.E.L.D. flying car and is making a super-fast getaway. Send Spider-ManTM to the rescue in his cool Spider-Cycle! Help Spider-ManTM catch this venomous villain and return the car to the good guys! Watch out for Venom's vicious symbiont web attack! Use the folding wheels on both vehicles for the perfect high-speed pursuit in the air or on land. Includes 3 minifigures: Spider-ManTM, VenomTM, and Nick FuryTM with weapon. Includes 3 minifigures: Spider-ManTM, VenomTM and Nick FuryTM with a gun. 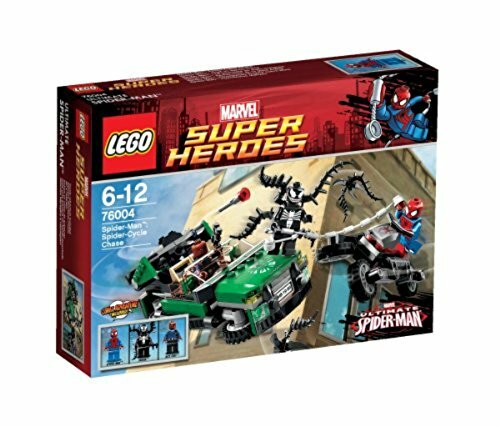 ;Features Spider-Cycle and S.H.I.E.L.D. flying car . ;Spider-Cycle measures over 1 (4cm) high, 3 (9cm) long and 1 (3cm) wide;S.H.I.E.L.D. flying car features folding wheels and hidden flick missile. ;Spider-Cycle features folding wheels .